Slate is a unique stone which is used in both the interiors and exteriors of homes in the Austin area. Because of its high porosity, the sealing of slate is very important. 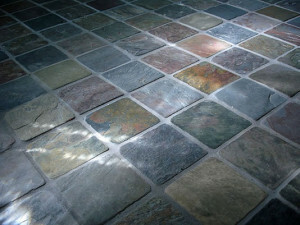 Imagine your dull, unattractive slate floor restored to its classy, rustic texture and dark, earthy tones. We can removes heavy waxes, floor finishes and soap residue from your slate floor. Our highly qualified professional technicians can restore your slate finish and resolve virtually any slate problem, including chipping and scratches. Santa Fe Floor Care offers restoration services and a variety of slate finishes, such as color enhancing, and topical coatings like sealers. When we seal slate, not only will we protect the stone, but we will also give the stone the finish you desire, be it a flat, satin, or shiny look. Part of our expertise at Santa Fe Floor Care is knowing which sealer to use under varying circumstances. Sweep or dust mop your floors regularly to remove anything that can get ground into the surface. Use only recommended cleaning products. Some acids, such as lemon or vinegar, and alkaline cleaners may etch the surface of slate, especially honed and polished slate surfaces. To prevent water spots after cleaning, dry your polished or honed slate with a soft cloth. We make it a point to educate our customers on proper stone care. For a FREE estimate on slate stripping, cleaning, sealing, enhancing, and other slate services throughout the Austin, TX area, contact us online or call (512) 632 1621 today.